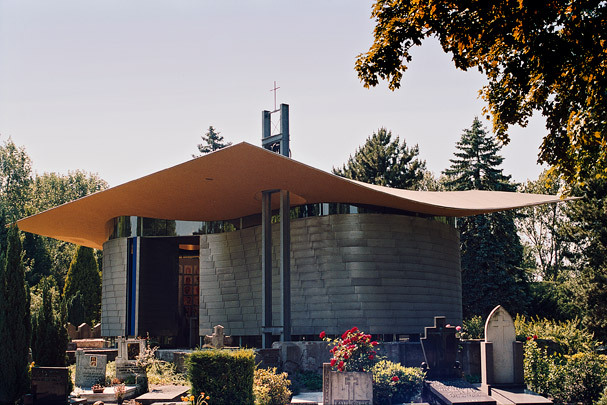 Crooswijk Catholic Cemetery occupies a pentagonal site enclosed by walls. It was laid out in 1868 to a formal plan with a chapel at its centre, with a straight avenue leading to it from the entrance. Among the memorials found here is the burial chamber belonging to the sweet and biscuit manufacturer C. Jamin. In 1936 there came a new entrance in the form of a gateway building in traditional brick architecture designed by J.P.L. Hendriks. After two earlier chapels had had to be demolished due to soil subsidence, a new permanent chapel of mourning was built on what remained of the earlier foundations. This consists of a winding wall (silver outside, a brilliant blue inside) in the shape of an 8 and a curving gold roof. The walls are held clear of both floor and roof so that light floods in along their upper and lower edges. The routeing is simple: one section of wall swings inwards to let visitors into the chapel and another swings outwards to access the cemetery on the opposite side. The contours of the old chapel are legible in the gravel plateau on which the new one stands.